Any time a new skill emerges, there is a period of chaos where trial and error is the name of the game. Babies persistently work to lift their heads during tummy time; they persevere through many failed attempts to finally roll over; and they wear the signs of trial and error all over when starting solid foods. All the hard work they put into mastering each new skill serves as a foundation for tackling the next developmental milestone on the horizon. Babies’ inherently strong level of motivation helps them to continue on this arduous journey, constantly facing new challenges and overcoming them on a daily basis. The subsequent development that occurs during the first year of life is nothing short of a miracle. So, why, after months of floor time/tummy time practice, when our babies finally gain functional mobility skills, does our society promote placing them in sitting: a position they have no idea how to get to or, more importantly, how to safely get out of? Watching a 6 month old on the floor is wonderful. All of the floor time (especially tummy time) they received starting from birth built the foundation for the function we see at 6 months. After all that time, they get it…they’ve practiced a lot and it’s a place they are comfortable. They can roll from point A to point B; they explore every inch of their body; they access toys out of reach by pivoting around or inch-worming; and they bring that toy back to play while on lying on the floor on tummy, back or side! And the best part is, as long as they are in a safe space, they really can’t get hurt because they are already on the floor. There is no falling. Babies rely on parents for many things, but they are also incredibly self-reliant when given the opportunity. 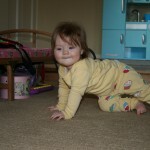 Though they love playing with you, and there should be a lot of that, they can and should practice independent exploration and play in positions that allow them to move and be functional…on the floor! This easy practice builds a strong foundation in sensory and motor development that will serve for all milestones and skills to yet to come. This takes us back to functional sitting. When babies are independent AND functional sitters, they have the ability to get into sitting by themselves and the knowledge of how their body works in space to help them safely get out of it. Functional sitting is mobile sitting with controlled weight shifts left, right, forward and backward, and on all the diagonals in between. These weight shifts allow for transitions down to the floor, across onto hands and knees or up to kneeling. Weight shifts also allow for long, stretched-out reaching to grasp a toy with a controlled return to sit for play. Functional sitting comes after the trials and errors trying to get to sitting independently; every failed attempt and subsequent problem solving tactic exposes babies to ALL the moves necessary to later control or stop a fall when they lose their balance in sitting. Functional sitters are immediately safer and more confident sitters than babies placed in sitting by a caregiver because babies who are placed in sitting have not yet practiced those moves that will help them maintain balance or control falls. Placed sitters often fall without trying to slow it, and even forcefully extend backwards because they haven’t learned how counterproductive (and dangerous) that is. Emotionally, functional sitters know where they are and how they got there, reducing anxiety and increasing their sense independent accomplishment (true self-confidence). And, it’s never too early to provide opportunities for your baby to build self-confidence…from the ground, up! Though I’m advocating for more time on the floor (tummy, back, side) until baby is a functional sitter, there is a time and place for sitting baby upright. When your baby can sit upright without the need for propping by baby gear or with their own hands, it is safe to have supervised independent sit time on the floor. You can also support your baby in sitting on your lap, engaging in cuddles, fun play and movement games. And who doesn’t love a game of “timber” on the bed?!?!? All of this is good fun and safe. But, when placing your baby down, rather than setting up padding 360 degrees around your independent, but not yet functional, sitter, consider placing him on the floor where he is safe, mobile without anxiety or risk for injury, and free to move, explore, play and learn. At the top of this post is a video of Kellan getting up into sitting for the second time. (I missed the first time by 30 seconds). He is 7 months, 3 weeks and though he sat independently when placed at the typical six-month mark (yes, we tested him), we chose to keep him on the floor on tummy, back or side whenever we placed him down. This confident, proud and functional sitter is our reward: a baby who, once in sitting, automatically had the confidence to move around, risk falls, actually lose his balance and fall with control and then go right on playing happily. * The independent transition to sit typically takes place between 7 and 8 months rather than the 6-month mark for placed independent sitting. 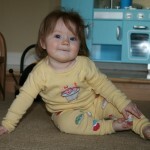 * When not wearing or carrying your baby, provide floor time on tummy, side or back rather than placing them in sitting. Let them find their way independently…you can always coach them with your words as they move (a great play and bonding experience). * When you do sit with your baby, please avoid using plastic containers/props and gear that are specifically designed to sit pre-sitters upright/vertical before they are ready (there are popular products out there that do this). A four month baby is not ready to be sitting upright with gear, but can be upright on a caregiver’s lap where dynamic and responsive support is provided to maintain proper alignment. Now that you’ve done all this reading…Here’s to Moving, Playing and Growing! Was wondering if your recommendation for not placing kids in sitting and instead waiting for them to get into sitting independently applies to atypical developing kids as well? I am a pediatric physical therapist as well and have really loved reading your posts and am already using a lot of your tips to help educate my families! Just curious if there is an exception to avoiding placed sitting when working with a child that has difficulty motor planning? Thanks for your help! Thanks so much for reading and for your comment. I would say this recommendation is primarily for the babies who are typically developing. If left to their own devices, babies developing atypically will usually figure out a way to get up (depending on the severity of their issues). But with sensory-motor deficits or neuro-motor deficits, often you find movement patterns that are very atypical and do not serve as good foundations off which future skills are built. The patterns of movement become fixed rather than fluid and babies remain stuck rather than jumping off into new horizons. With the atypical babies and kiddos I spend a lot of time facilitating movement in the frontal and transverse planes (they are normally stuck in the sagittal plane), so they can build good foundations and show appropriate functional skills. You also want to be sure to treat the age of the child. When treating you don’t need to follow the developmental sequence, but really work in the past, present and future, always asking yourself if this child were 13 or 30 or 50 years old, would this be a functional way for them to move. If the answer is no, it is important to teach them other options and increase the repertoire. 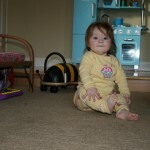 Thanks for your comment on my blog post in September (https://consciousbabyblog.wordpress.com/2013/07/21/how-independent-sitting-happens/). I’ve been traveling and am just now getting back to responses. I love the distinction you make between “independent” and “functional” sitting. I have some observations about the vid–are you interested in further conversation?